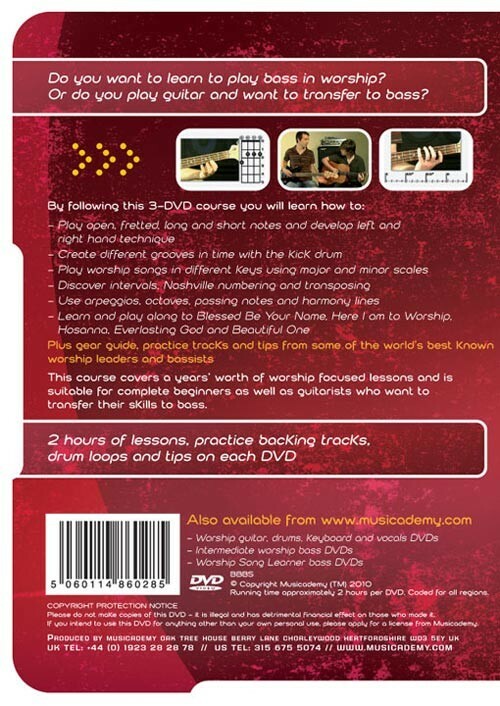 Three 2-hour DVDs in a box set covering about a years' worship focussed instruction. The course is taught by top Christian session musician Matt Weeks whose credits include Matt Redman, Tim Hughes, Chris Tomlin, Brian Doerksen, Paul Baloche, Graham Kendrick, Vineyard Music and many others. Plus gear guide, practice tracks and tips from some of the world's best known worship leaders and bassists including Chris Tomlin's bass player Jesse Reeves. 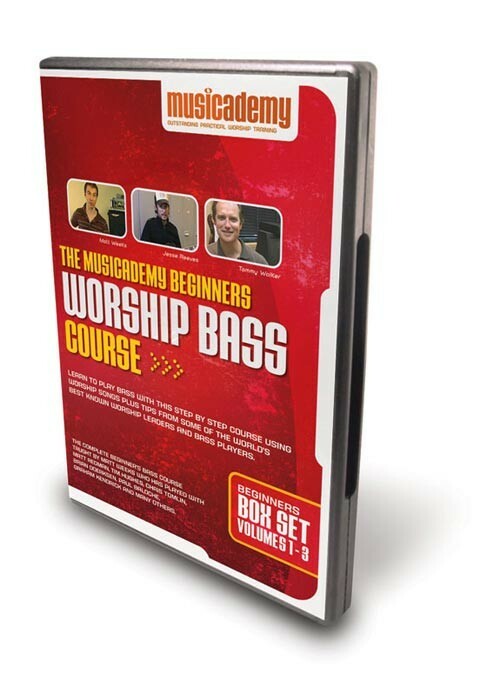 This course covers a years' worth of worship focused lessons and is suitable for complete beginners as well as guitarists who want to transfer their skills to bass. Songs featured on this DVD set include Blessed Be Your Name, Here I am to Worship, Hosanna, Everlasting God and Beautiful One. 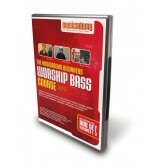 As a Beginners course, the box set is suitable for complete beginners who have never played bass before. Its also helpful for self taught players who want to go through all the basics and fill in any gaps intheir playing and improve their technique. The course is also designed for guitarists wanted to transfer to bass. If you are already a relatively accomplished player (i.e. already playing proficiently in a worship band) then we'd suggest you go straight to the Intermediate set. I was asked if I could play bass in church. No, I replied - for two reasons. 1) I dont have a bass guitar and 2) I don't know how to play one. The Lord does move in mysterious ways. I found myself on a business trip in PMT's Manchester. They had a Squier Jaguar Short Scale at decent price and I felt driven to buy it (telling the Mrs that God prompted me to but it didn't quite work). So one down one to go. Then I found Matt Week's course on YouTube. This made the bass accessible - So I bought Beginners, Intermediate and Song Learners as a job lot [I think Musicademy site makes it hard to work out which DVDs combo to get though]. I knew the Lord was with me when the Mrs prompted me to buy an Orange amp. Instead of buying brand new I bid for two amps on eBay - theory was I would get one. Well I won both - total cost 70% of brand new amp and by following Matt's Beginners DVD I was humbly playing within 6 weeks. I think she sees now that this was part of God's plan for me. My bass guitar makes me feel young again and I really am learning humility from the teachings and anecdotes given on the DVD. I am there in a non muddy part of the spectrum to add some fundamentals to the worship - not to over play or steal the show. Less is more - adding tension/ resonance by NOT playing all the time is uber cool. Just started on the song learner and found the members download section really useful. Thanks again - I can highly recommend these DVDs. I enjoy the lessons. They are very easy to follow. However, i am not sure what i accomplished by odering tje down loads 1-8. I need some clarification on them. So if i could get some guidance that would be great. Am also about to order the package for playing the key board as well. Please email us any queries and we'll help you out that way. I've really enjoyed this course, I tried learning straight off the internet and got nowhere. So I signed up for the beginners worship bass course, the best thing I ever did. It was so easy to follow, explaining every step of the way in simple terms, but moving along at a reasonable pace so you don't get bogged down. Matt Weeks is such a good teacher, he sort of became a friend over the duration of the course, so thanks to him. I now play regularly in my church worship band, it's great. Well done musicademy. The video instructions are great - very clear and at a good pace. However, the volumes of different parts are inconsistent, sometimes very loud and sometimes inaudible (especially some interviews). I have been learning bass on and off for about 5 years. I have picked up something here another thing there. The reason I love this program is because it starts in the beginning and progressivly gets harder. I would say it is better than the last bass teacher I had! Eveything i exspected. | Review by lou lou. I love it , it is worth every penny. 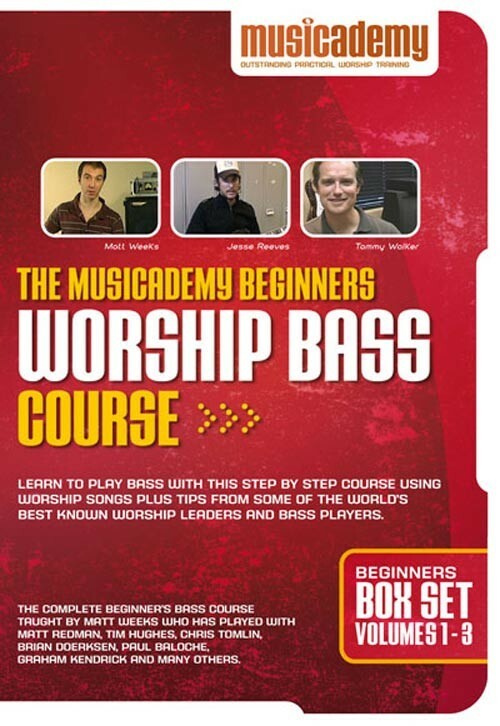 If you are looking for a beginning bass course focused on worship music, this is perfect. Format is great and easy to get lots of short duration practices in daily. I had some bass training going in so I moved very quickly through Volume 1. Volume 2&3 gave me a great addition in my foundation. I took lessons for a year and got nowhere close to where I got with this series. I now play in our praise team and a local contempory Christian band thanks to this series. Can't say enough good things about it!!! I purchased the Bass Beginners DVD collection and I have been thrilled with this purchase. Not only have the lessons be easy to understand, but the fact they show you how to add rhythm patterns is awesome. I had been taking lessons for a professional Bass instructor and when I added these lessons to my learning experience I really started to grow in my playing ability. My instructed was very pleased and surprised at how quickly I started to advance. Now, understand this; I was 46 when I started taking the lessons and using these DVD's. I am now 48 and have been playing in a Praise Band for the past 9 months! I am a Pastor and I play in our Praise Band as well. How cool is that? Yea, that's cool. I have also been asked to play with two other singers who play the guitar and travel to local churches and play at special events. All in all this purchase was a most excellent decision. It's been a great help, useful, and very effective.